A blister; I think it looks like a blister. A sunburned baldie! I reckon that’s what it is. A jelly draped in dust? Wibble wobble. A rusty fist punching the blackened sky. So poetic! A bolt, tying down the crust of earth? Just imagine! A giant baked bean. We just need some toast and butter and sweet hot tea. A big baboon arse poking up and out! A chunk of fallen sun, stricken, lonely in the outback. So what is it? That my friends, is Uluru. 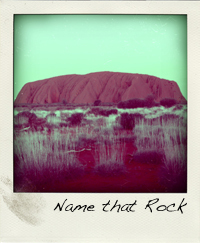 Prior to arriving at the base of Uluru (Ayers Rock) I’d presumed it to be a big, smooth-red elongated hill. It turned out to be pitted and grooved, its surface peeling with onionskin weathering and stained by chemical erosion. At points there were inlets leading to waterfalls, memories and pools of water. The air had warmed since our sunrise reunion with Uluru where we watched her undress from the twilight cloak we’d seen slip over her the evening before. I say her, for no other reason than Uluru exudes femininity. In the warmth that attracts people from far and wide; and in her flirting mystique. A boldness that displays a brave and adventurous spirit. Pockets of her prerogative, secrets that will never be revealed. Red – the colour of love. Orange – the colour of sunset romance. Indigo – the colour of her Casanovas shadow? 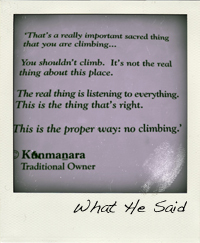 If one thing disappointed me about Uluru it was the 50% of visitors who displayed gross ignorance towards the requests of the traditional owners (the Anangu people); “Please Don’t Climb Uluru”. Yet through some leaseholder loophole the government deem it ok to allow the hundreds each day that do (it’s also free to climb so other than physical exertion there’s nothing to deter that Army of Ignorants). According to one white guide the opportunity will be withdrawn should one more person perish (the current total is 35) and this is the number one reason for the Anangu’s plea. A hundred throws from Uluru is the equally impressive site of Kata Tjuta (The Olgas). The familiar rusty red formations looking not unlike a punctured Uluru inflatale. It’s grooves allow for awe inspiring crevices that tower above us mere mortals as if being some deep lung to scream the Dreamtime stories across an endless land. 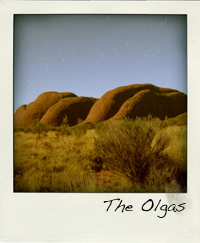 In many ways, reaching Uluru was the pinacle of our journey in Australia. Reb and I could both sense and appreciate the inward journey, we both shared the sensation that we were standing in the centre of the Southern Land and that we’d travelled thousands of highway kilometres to get there. From this point, the only way out was back the way we’d come in – the thousands of klicks back! There was one more sensational stop at Watarrka (Kings Canyon) for a wholly unexpected skitter around the ridges and rims of the marvelled summit. Palms and eucalypts found spots to gather along the sheer cliff faces that spoke exclusively to each other across the deep canyon whose air was permeated with spirits of the ancient stories. “Very thin” gestured a Japanese tourist, his wife sat silently painting with watercolours. I don’t like being referred to as ‘thin’, it implies weakness. “Very thin” he persisted, pointing at me as I sat a safe distance from the lip of the cliff. I pulled out a biscuit as if to show him that I actually eat, and then his wife lifted her dainty face from the shadow of her sun hat and joined the torment. ‘Great’, I mused. A pair of Japanese bullies. 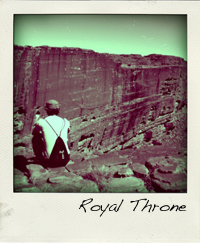 Seconds later I cottoned on; I was sat on a “very thin” rocky outcrop above an endless void. “Why didn’t you say sooner?” I joked, then crunched into another biscuit. The journey to Australia’s red centre was concluded, and with the large sun dipping away we gathered our things and hit the highway. It was only now, after this baptism of culture that I finally knew my journey of Australia had truly begun.